Bellaghy (Baile Eachaidh) is situated north west of Lough Neagh and about five miles north east of Magherafelt in south Derry. It straddles the townlands of Drumanee Upper, Mullaghboy and Oldtown (Downing) in the parish of Ballyscullion in the Barony of Loughinsholin. The village is only a few miles from New Ferry, the river Bann, Lough Beg and Church Island (Inis Taoide). It has been an area of settlement dating back 9,000 years to the end of the last ice age and provided a home to Neolithic and Mesolithic peoples. Early settlers would have navigated their way up the river Bann from Coleraine and the north coast and survived on the plentiful supplies of fish and game from the river and surrounding forests. Evidence of our earliest ancestors can still be found in the flints (axe and arrow heads) that are frequently dug up along the river and in the remains of crannógs around the district. Woodland provided birch, pine and hazel for tools and shelter. Sandy soils were easy to cultivate. The very early settlers brought flint from the coast, stone for axes from Tievebulliagh (North Antrim) 5000 years ago, gold from the Sperrins 3000 years ago and iron from Bannion around 2000 years ago. The quantity and quality of archaeological finds from this area is astonishing. Hundreds of thousands of fine Mesolithic flints, dozens of Neolithic flints and axes, many fine late Bronze Age and Iron Age weapons, such as swords and shields, tools, cauldrons and horse bits showing superb, sophisticated ornament, have been found in and around the Lough Neagh, Newferry and Lower Bann area. 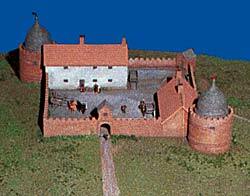 During the middle ages there was a monastic site on Church Island. Prior to the establishment of towns as we know them today, the main settlements (mostly monastic) in County Derry were at Derry, Banagher, Ardstraw, Dungiven, Limavady, Loughinsholin, Maghera and Church Island. Elsewhere there were fortified raths or ringforts. These were wealthy farmsteads, usually circular enclosures of about 30 metres in diameter surrounded by a ditch outside and an inner earthen bank, which an attacker had to surmount before the farmyard and dwelling was reached. Most ringforts would have had the use of a souterrain, an underground passage where food was stored and in an emergency acted as the last line of defence. Many of the people would have lived and farmed close by and when danger threatened, they would have taken refuge there and helped to defend the place. The law at this time was maintained and enforced by the Brehons, the wandering jurists from at least the first century B.C. These laws were first written down in the seventh century and for almost a thousand years after that, they formed the legal code of the Irish people in all kinds of disputes and for crimes that ranged from allowing hens to stray to homicide. The way of life for the Irish people under Brehon Laws would have been constant and unchanging for centuries. However, with the defeat of the Irish Clan Chiefs at Kinsale in 1601 and their subsequent exile to Europe in 1607, the political landscape changed and according to many historians, the events of this period were the genesis of the nationalistic and sectarian conflict that blighted our society for so long. With the exile of the Gaelic Irish leaders, a decision was quickly taken to resettle a large portion of Ulster. To ensure the success of the venture, a number of London’s Commercial Companies were notified that tracts of land in Ireland were available on favourable terms. The number of applications received was more than the available lots (there were only 12 portions to allocate) and it was decided to determine the outcome by way of a lottery. This took place in London on the 17th December 1613 and was presided over by an Alderman Cockaine Rowland Smart, the city’s official sword bearer. In south Derry, an area in excess of 32,000 acres that stretched from Lough Beg to the south, to outside Maghera to the north and bounded east and west by the rivers Bann and Moyola was allocated to the Vintners’ Company of London. 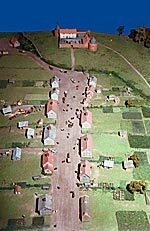 By 1622, a new settlement was built comprising a church, castle (Bawn), corn mill and twelve houses along a wide street, known today as Castle Street. The location, close to the river Bann was considered ideal for trade. The name Bellaghy was originally applied only to the townland while the town itself was called Vintners’ town. The name Bellaghy was later extended to cover the settlement as well. Other towns were successfully renamed (Salterstown, Draperstown). The work of building a new town was started by John Rowley around 1614 but he died soon after in 1617. The Vintners’ Company then took the opportunity to relocate Baptist Jones to complete the project. Jones had been working on the development of Salterstown. Scholars have offered different explanations for the name Bellaghy. Béal Lathaigh translated as “the mouth of the marsh or miry place” (Joyce) provides an image of what the land around the settlement was like. Before a series of drainage schemes were carried out on the river Bann, it was possible during winter months and periods of inclement weather to get close to the town by boat. Greg Toner favours the translation Baile Eachaidh “Eochy’s townland” (and also mentions Baile Achaidh, “townland of the field”). A map of the town by Thomas Raven (below) shows that the houses were mostly timber framed, with accommodation on two floors and an attic lighted by dormer windows. Most of the houses had a slate roof with chimneys of stone or brick in the centre of the ridge although plans of the village show that some houses may have been thatched. They were all detached dwellings and had large gardens to the rear.The houses are thought to have been pre-fabricated in England before being shipped to Ireland. Three of the houses were situated at one end of the village street. Others were scattered here and there in an irregular manner. It would appear that the occupants of the slated houses held a higher position in life, as their names were recorded on the plan, while the others were not. The thatched dwellings were, perhaps, occupied by a mixture of native and plantation stock. This was a period of turmoil in Ireland, especially in Ulster and the Plantation policy was deeply resented by the indigenous people and the new arrivals needed to be constantly on their guard. During the rebellion of 1641, the Bawn was attacked but remained largely intact although many of the other houses were burnt to the ground. During the 17th and 18th centuries, the locals were engaged in farming, fishing, iron smelting and other trades including, Lodging House Keepers, Inn Keepers, Spirit Merchants, Masons, Grocers, Bakers, Butchers, Blacksmiths, Police Constables, Surgeons and Teachers. The first Police Station, with five constables, was established in 1836 and in 1852 a dispensary providing a service to the poor and for the prevention of diseases was opened. With the growth of the linen industry, part time employment was created through the introduction of in-house weaving and spinning. The census of 1841, just prior to the famine showed that there were 739 people (143 families in 123 houses) living in the village. These people were engaged in agriculture, trade and manufacturing or other forms of earning a living. By 1851, the population was 608 and by 1891 it had fallen to 447. The decline in the population of almost 40% in 50 years could be attributed to famine and emigration. Church Island is not exactly an island but from time to time is surrounded by water depending on the water levels of the river Bann. It is only accessible on foot over marshy land during drier months of the year. The site has an old ruined church dating back to the time of St Patrick. It is thought that Patrick used the Bann to navigate to the island on Lough Beg where he met with Taoide to found an early Christian settlement in the 5th Century. That settlement is recorded as Inis Taoide (Taoide’s Island) in the Annals of Ulster of the 11thcentury. The current church dates from the 12th century but there is a stone known as the Bullaun Stone featuring a hole which holds water. The Bullaun Stone is most likely associated with the first monastic settlement. Local anecdote has it that the hole in the stone was made by St Patrick as he knelt to pray. Bishop Hervey (of the Bristol Cream family) built a spire on the island in the late 1770s because apparently, he wanted to be able to look out from his house (Ballyscullion House) and be able to see a spire. The spire is just for show and is known locally as Hervey’s Folly. It is believed that Folly Hill (or Folly Brae as it is known locally) gets its name from the view of the spire from its summit. During the Second World War, an aircraft from the nearby American airbase at Creagh, collided with the spire causing it to bend. The spire has since been partially straightened by the Department of the Environment. There is a graveyard on Church Island with at least 53 people buried there including members of the Scullion, Keenan and Diamond families. Annual pilgrimages to the island on the first Sunday in September (nearest Sunday to the Feast of St Taoide) were re-inaugurated in 1910. This lavish mansion on the shores of Lough Beg was the brainchild of the Bishop of Derry and Earl of Bristol, Frederick Augustus Hervey although the building, started in 1787, was never completed. Ballyscullion House was modelled on the Hervey home in Icksworth near Ipswich in England and had 365 windows – a window for each day of the year. It is generally believed that the house was not finished since its completion would have coincided with the British Government’s introduction of the Window Levy during the Napoleonic Wars to pay for the war with France. Hervey’s ambitious mansion was therefore not economically viable. After the death of Hervey in 1803, the house at Ballyscullion and another which he owned at Downhill transferred to his cousins the Bruces however, they decided not to keep two large houses and so the unfinished property at Ballyscullion was gradually dismantled and various parts were sold off. The great portico (designed either by Frances Shandys or Michael Shanahan of Cork) was transported to Belfast in 1813, where it now forms the front of St. George’s Church in High Street. Rumour has it that the transportation was done in a unique way – by barge using the Bann or the (now defunct) Lagan Navigation. One of the marble fireplaces from the old mansion now stands in the library in Bellaghy Bawn. Only a few odds and ends of stonework remain at the original site. Much of the stonework of the original house was re-used in the building of the new Ballyscullion house on a site nearby on the same lands. The second Ballyscullion House was built in 1840 by Sir Charles Lanyon for Admiral Sir Henry William Bruce, a younger son of the Rev. Sir Henry Hervey Aston Bruce. The Admiral had fought as a boy aged 13, at the Battle of Trafalgar and went on to become Commander in Chief, Pacific Station from 1854 to 1857 and Commander in Chief, Portsmouth from 1860 to 1863. Ballyscullion house was bought from the Bruce family by Sir Henry and Lady Mulholland in 1938. Sir Henry Mulholland was Speaker of the Stormont Government from 1929 to 1945. During the Second World War, Camp Ballyscullion was prepared by the 202nd Engineering Combat Battalion for US soldiers of the 82nd Airborne Division before D-Day. The word “Bawn” is derived from two Gaelic words; “Ba” meaning “cow” or “cattle” and “Dhun“, meaning “fort“, translating roughly into “cow-fort” or “cattle-fort“, so the anglicized form of “badhun“, was “Bawn“. 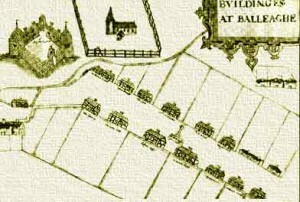 The building of the Bawn at Bellaghy was started circa 1614 by John Rowley, however, he died quite soon after beginning the project in 1617. In order to keep things moving, the Vintners’ Company relocated another agent, Baptist Jones, from his previous duty of building Salterstown. Some accounts have it that Jones was about to be dismissed from that project for being far too slow. Jones died six years later in 1623 in debt to the Vintners’ Company. This time the company appointed a new agent called Henry Conway to take over Jones’ affairs. He certainly did that, including marrying Jones’ widow and taking over his debts to the company. Conway obtained a new lease for Bellaghy in 1625. Bellaghy Bawn is square in plan. Its south-eastern corner is fortified by a stout, rounded flanker tower showing an early use of local red-brick, placed above a stone footing. Excavation has recovered traces of a similar tower at the diagonally opposite corner, and the south end of the west wall was protected by a square tower (picture below). There was a raised platform along the southern part of the west wall, and excavation has uncovered traces of an original house against the west wall north of this platform and evidence that the building was constructed on the site of a much earlier Gaelic ringfort. The Bawn provided protection to the house, the family and property of the plantation’s principal landlord. The house could be free-standing in the centre of the Bawn or, as was the case at Bellaghy and at the Salters’ Company in Magherafelt and Salterstown, positioned up against one of the peripheral walls. The original Bawn was virtually destroyed in the 1641 rebellion when the greater part of Bellaghy was burnt to the ground. During the siege, Henry Conway brought all his local paying settlers/ residents from the village inside the Bawn walls to protect them from the Irish who were rampaging. A local division of Irish troops led by Peter O’Hagan arrived at the gates to take the Bawn by force. Conway went outside to negotiate with the troops and instead made a personal deal with O’Hagan, ensuring a safe escape for himself and his family. Conway was never seen again. He left the local residents to their own devices against the Irish onslaught. The Bawn was subsequently rebuilt in 1643. A completely new house was built in its place around 1791. One of the original flanker towers still remains today. The Bawn was eventually purchased around 1880 by a Doctor Thompson who conducted his surgery on the premises. The doctor owned one of the first cars north of Lough Neagh, a Benz, which he bought for £400 in 1918. In those days, when there was a sufficient patient waiting list for operations, a surgeon would be called from Belfast. A downstairs room in the Bawn would be scrubbed down and the operations would be carried out on the “kitchen” table. Dr Thompson used to take the acetylene lamps off the Benz car and hang them up to illuminate the operating table after the hours of darkness. There was a set of stocks in the centre of the town standing beside the market cross. Rumour has it that they were put to use most often as a punishment for drunkenness. It is known that Baptist Jones also used stocks in Salterstown to punish idleness. A newly built replica of the stocks now sits in the grounds of Bellaghy Bawn. The Bawn was restored and opened to the public in 1996 under the guidance of Bellaghy Development Association and the Department of the Environment. It has been used to house exhibitions on local natural history, the Plantation and the work of poet and Nobel Laureate Seamus Heaney and aims to generate some tourist revenue for the village as well as serve as a focal point for cultural / educational activities. The Bawn and surrounding buildings are whitewashed today and only a little of the original red-brick construction remains visible on a small defence tower however, it is now regarded as one of the finest examples of the restoration of a fortified house in Ulster. There is a library in the Bawn which is devoted to Seamus Heaney and his work. It contains unique material from the poet together with many of his manuscripts, books and all his broadcasts and television work. Even his old schoolbag is there from his days at Anahorish Primary School. Guided tours include a special film by Seamus Heaney while the history and environment of the area are uniquely interpreted through associations with Heaney’s poetry. The modern day Bawn features a beautiful circular carpet in the upper floor of the flanker tower. The carpet has been specially created with the points of the compass and is correctly aligned to the north, south, east and west. Some residents of Bellaghy will tell you that it is at the very centre of Northern Ireland and thus the carpet points outwards to the four corners of Ulster. Today the village has expanded, its population has increased (most up to date census). It is well served by modern shops, schools, pharmacy, a medical centre and houses of worship. Recreational facilities are in place and the local GAA club has provided a first class sports complex that caters for all ages.